Naperville, Illinois — Twocanoes Software has released Winclone 7, an upgrade to its award-winning Boot Camp imaging and migration software for the Mac. Winclone 7 features incremental imaging, a brand new interface, support for Microsoft MDT/SCCM and automatic configuration of Windows during the imaging process. 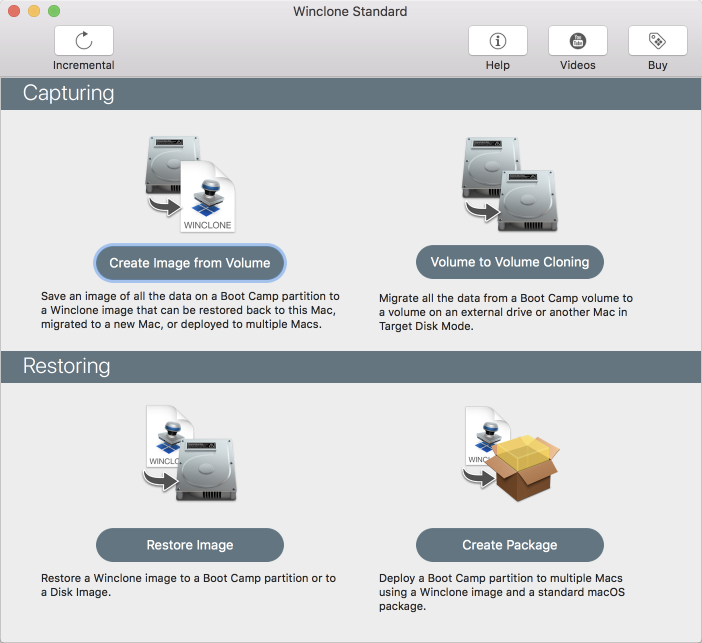 Winclone 7 for macOS creates an exact clone of the Boot Camp partition for use as a backup or to migrate a Boot Camp partition to a new Mac. If disaster strikes, restore Boot Camp from a Winclone image and instantly be back up and running. Winclone Pro and Winclone Enterprise enables package deployment of Windows on Mac hardware. Using Mac client management suites, deploy Boot Camp partitions as easily as installing a software package. Winclone Pro Enterprise adds in subscription pricing and support for Microsoft MDT/SCCM deployments. Winclone Pro Enterprise uses your IT organizations’ current infrastructure to deploy Windows on Mac hardware. Protect all the time and energy you spent getting Windows and all your programs installed and set up in Boot Camp. Create a Winclone image of your Boot Camp partition and snap back to that same setup in minutes. Winclone 7 now features incremental cloning for fast updates to existing images. Winclone Pro saves package installers that create a Boot Camp partition and restore a Winclone image to the new partition. Winclone packages can be deployed using any client management system that can deploy macOS packages. If you can install a package, you can deploy a Boot Camp partition. Winclone Enterprise enables you to use your IT organizations’ current infrastructure to deploy Windows on Mac hardware. Run Task Sequences from Microsoft MDT or SCCM to fully image Windows on to the Mac. If your users are remote, Winclone Enterprise supports image customization that will fully configure and setup Windows on the Mac. Winclone Pro Enterprise features the same great software as Winclone Pro and adds Enterprise integration support and subscription pricing. Winclone Standard is USD$39.99 and includes licenses for 2 Macs. Winclone Pro is USD$499.99 for 50 clients and includes perpetual licensing and standard support. Winclone Pro Enterprise is $5 per Mac per year and features subscription-based licensing and enterprise integration support (minimum 200 clients). Availability: Winclone 7 (all editions) is available worldwide today.